This post is brought to you by the letters R and L as part of Robin Renee’s BLOG MARCH 2017, a fantastic voyage for all six senses! As a teacher of literature to undergraduate students, I face difficult conversations about the history of American eugenics, the onset of catastrophic climate change, and the effects of Jar Jar Binks on the Star Wars franchise. Against the wisdom of my elders, who characterize Millennials as melting snowflakes, I must report that my students are tough, determined, and not easily fooled. [irony]I am sure this will be a popular view. [/irony] Admittedly, these are broad strokes about the American middle class, such as it is these days, but there is a problem, and it isn’t over-sensitivity. What hounds my students, I find, is the madness of being stuck in someone else’s story. Afflicted with a Hunger Games job market, they are told that they are lazy. Witness to the racial, sexual, and economic violence of our times, they are told to stop complaining. They are so easily triggered, submerged by rent and the rising tide. I share their confusion at such smug narratives. A generation earlier, I graduated into a recession, only to be told it was my fault I was a temporary worker with a college degree. The Matrix of America taught me to confuse structural and personal problems too. The experiments in student debt, the new Jim Crow, and endless war were conducted on Gen X before M, and therein lies some good news, if we choose to make it so. The Millennials are not alone: they have cranky older friends who aren’t high on our own supply. We assure them they are not crazy or blind, not exaggerating the anxious twitch under their tattoos. The gifts that X offers are signified by a band we share, Green Day, and drawn from their prescient album American Idiot. Those gifts are rage and love. “I’m the son of rage and love” sang Billie Joe Armstrong in “Jesus of Suburbia.” This is a moment of repentance for me: in the snobbery borne of Dead Kennedys and New Wave, I was not sure Green Day was really punk until this album. But there in the heart of the Iraq War came a melodic yet righteous protest that I am happy to share with my Millennial friends: rage at the state of the world and a burning love for it. If the art of X has succeeded in shaping any new story, it is the persistence of Scooby-Gangs in the name of justice (thank you, Buffy). The latest Guardians of the Galaxy is nothing if not a declaration of solidarity among funky friends in the face of murderous patriarchs. That’s a story we can use these days, one that evolves. One change, as X ages, is the younger allies that rise in the plot. Among my students, I pose as the grumpy old Logan in the film of the same name, no longer healing the way I used to, but still with the adamantium claws. After all the harrumphing about corporate villains and mercenaries, Logan admits that he cares about X-23, the deadly daughter he never planned for. “Does she remind you of anyone?” asks Patrick Stewart. You don’t need to be a telepath to get the point. Logan’s anger, his will to fight, was always an urge to give new mutants a chance. X-Men comics are never about defense alone, but the creation of refuge that allows children to grow into citizens. This too is a kind of love–not romantic or parental, but republican, the foundation of the res publica, the commonwealth. So it falls to us to tell another tale beyond the tropes of generational failure. “The bible of none of the above,” dear Green Day, is not a blank book: we are writing it. To our Millennial friends, let us say: today is a good day to struggle with love, to make a better republic and to save the world a lot. We are on our way. We’re with you now. Like la lutte, the Blog March continues: Check out Jessica Walsh tomorrow at A Wellness Journey to My Better Self and a Simpler Life! In the fall, I’m teaching a course called “Postmodern Fiction and Environmental Justice,” and the last novel we will read is The Hunger Games. Having just finished it myself (I saw the movie first), I am still in shock that such a profoundly dystopian novel has become so popular. I mean, I was a teenage doomster, but most of my peers were not. My contacts in the tween world inform me that entire schools become obsessed with this novel at once. So now I am starting to think about how to approach this with the class. By the time we arrive at December, we will have thoroughly discussed such cheerful topics as environmental racism, corporate capitalism, and climate change. The Hunger Games will fit right in, once I explain the history of coal mining in Appalachia. But I am very much interested in the way postmodern fictions produce hope as a narrative effect, and the hope of this novel centers on the lack of a double-suicide in the protagonists! Woo-hoo! Yes, the success of Katniss and Peeta implies the possibility of rebellion against the metropole, and the use of the term “district” points to the successful struggle against South African apartheid, but…that’s not a lot by itself. I will be using this space to think through these problems. If anyone has any suggestions, especially if you’ve taught the novel before, please feel free to chime in. How Does Glitchy Art Show Us Broken Is Beautiful? This video, from PBS Idea Channel, may help environmental humanists and our students consider the virtues of aesthetics beyond the picturesque and the sublime. Author Anthony LioiPosted on July 25, 2013 Format VideoLeave a comment on How Does Glitchy Art Show Us Broken Is Beautiful? A new and necessary genre. Also, in this case, hilarious. I just had the pleasure of attending the summer seminar “Ecology and Ethnicity: Sustainability Studies’ Contributions to Place,” sponsored by the Sustainability Institute of the University of New Hampshire and led by Siobhan Senier of the English Department. After reviewing the history of sustainability and the rise of Sustainability Studies as a field, the seminar asked pointed questions about the contributions of the environmental humanities to that field. It asked how the project of sustainability should be informed by issues of race and ethnicity as “wicked problems” that humanists study. We were addressed by Darren Ranco, an anthropologist from the University of Maine who studies the impact of the Emerald Ash Borer–an invasive insect that destroys ash trees–on Wabanaki basket-making, and by Angel David Nieves, a professor of Africana Studies at Hamilton College, whose research traces the rebuilding of District 6, a multicultural neighborhood of Cape Town, South Africa, that was razed under apartheid. One of the most provocative concepts they addressed was cultural sustainability, the aspect of sustainability excluded from technocratic treatments. Following David Throsby, we can understand cultural sustainability as the promotion of cultural diversity as an aspect of ecological sustainability. Our field trip to Portsmouth, New Hampshire, provided a lesson in cultural sustainability through our investigation of its African Burying Ground. The African Burying Ground, originally a swamp where African slaves and indentured servants were buried, dates from the eighteenth century. 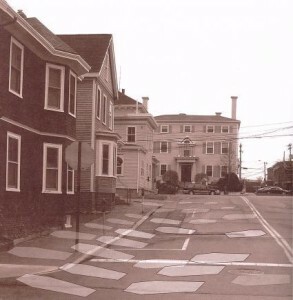 This ground was paved over in the twentieth century, and the graves lie under Chestnut Street, as seen in the photograph below, taken from In Honor of Those Forgotten: The Portsmouth, New Hampshire African Burying Ground. The situation of the Burying Ground illustrates the intersection of cultural sustainability with ethnicity. While the graves of English townspeople from the same period are well-preserved, raised off the street level and marked by fence and gravestones, the African graves were unmarked and forgotten until very recently. This raises questions of racial equity in the representation of history. Whose history is honored? Whose history is accessible to the public? How does the loss of memory shape our use of urban space, and whose interests are served by this loss? Who benefits from the recovery of the Burying Ground? What is the relationship between the forgotten graves and the filling-in of their swamp? When examined on the scale of centuries, these questions clearly fall under the rubric of intergenerational equity, an important principle in Sustainability Studies, which states that a sustainable culture should not steal from the future or the past to serve the present. In Portsmouth, intergenerational inequity is inflected by race: the white masters are remembered and the black servants are forgotten. 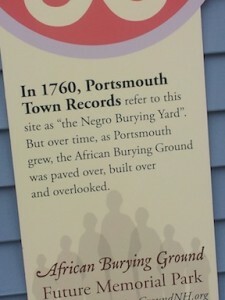 But equity, understood across race, also suggests that the loss of the African Burying Ground disfigures the present of Portsmouth because the city has been shaped by African American lives since 1645. Sustainability teaches us that the burying ground must be recovered in order to understand the history of the city’s land and water, which is also the story of race and power. This sign is posted on the side of a house used as a local business, demonstrating the potential conflict between economic and cultural sustainability: once the memorial park is built, the business will have to relocate, and the character of this part of Portsmouth will change. However, because the reclamation of the burying ground was pursued as a public matter, it has become a matter of civic pride, raising the cultural capital of the city itself, as demonstrated by the rhetoric of the project’s web site. The city hired professional archaeologists and designers to investigate the grounds and design an appropriate memorial, resurrecting the memory of the African dead through an official civic process. The practical limitations of such work can be seen in the problem of financial capital. Though the project has been approved, it cannot move forward until all the funds for the memorial have been raised. Local sources suggest that the city has not raised half of the needed funds. Until the fundraising goal is reached, the creation of public memory will be stalled in its current state, where the memory of forgetting features more prominently than the ground itself. As material ecocriticism reminds us, the transformation of the land as a site of memory is more complicated than the transformation of media about the land. 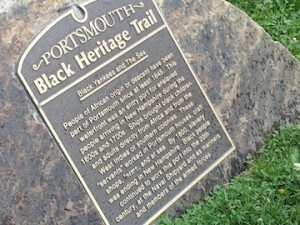 The case of the Portsmouth African Burying Ground demonstrates that the intersection of race and sustainability creates a long-term need for financial, cultural, and social resources that require the attention of communities over many decades. As ecocritics consider the practical import of sustainability and resilience, we should remember that intergenerational equity is broken across lines of race and ethnicity, and fashion our responses accordingly. The new journal Environmental Humanities is now online. Below is a video featuring Jane McGonigal, game theorist and author of Reality Is Broken, a book about the use of games as heuristic devices for solving problems. Here, she talks about the way she overcame the despair that followed a serious head injury. Essentially, she made her recovery into a game, in which she deployed strategies, recruited allies, and told herself a story that enabled her recovery. It seems to me that the environmental humanities, especially those of us who work in rhetoric, have a lot to learn from this approach. As many have noted, American environmental rhetoric has often depended on fear as a motivating force. McGonigal details a technique that could be used en masse to mobilize hope. That’s really important, especially at the interface between scholarship and activism.